Since 1974, Bavarian Autosport catalog has been the enthusiast's choice for quality BMW parts & accessories for your classic or new BMW or new Mini Cooper. 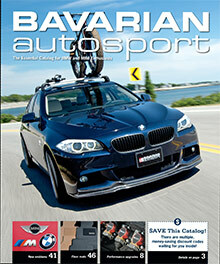 Your savings will be applied automatically at checkout on the Bavarian Autosport website. Exceptions include over-sized or heavy items. Valid in the contiguous US.